All new and only from Honda! 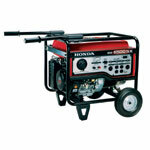 The Honda i-Deluxe Series generator offers 5000 watts of portable, inverter power. 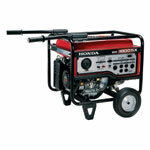 The EM5000isAB is ready to join you on your next outdoor adventure or provide emergency back up power for your home. You'll love the low noise operating level (62 to 68dBA) and so will your neighbors. 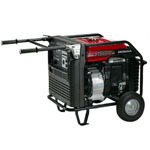 Standard features include electric starting, Honda's patented Eco-Throttle for extended run time, 120/240V selector switch, two-wheel transport kit and folding handles. 31.9" x 26.4 " x 27.2 "